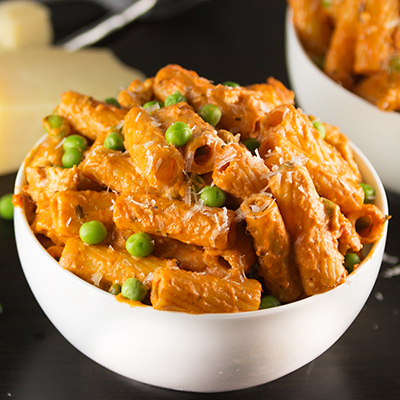 Spicy chicken, tons of garlic, a combo of alfredo and marinara sauce, and a handful of peas make up this Spicy Chicken Rigatoni, one of my favorite pasta dishes of all time from the restaurant Buca Di Beppo. If I had to make a list of my top 3 favorite pasta dishes (from restaurants) of all time, the Spicy Chicken Rigatoni from Buca Di Beppo would definitely be on there! It’s always been one of my favorites, so I decided I would try making my own version at home. Recreating recipes from some of my go-to restaurants is one of my favorite things to do in the kitchen. I love it when find a recipe at a restaurant that totally knocks my socks off, because then it provides me with the challenge to recreate the recipe at home. Wouldn’t it be fun to develop new menu creations for restaurants? I’m so excited about TNT’s new show starting tonight at 8/7c called On the Menu. Contestants will be competing to create the next latest and greatest dish that will appear on the menu of some of your favorite restaurants like Chili’s, Denny’s, Outback, and yes… even my beloved Buca Di Beppo! I watched two different trailers for the show and I can already tell that I’m going to be hooked! Here’s the first clip, and here’s the second. Did you go watch ‘em? What did you think? 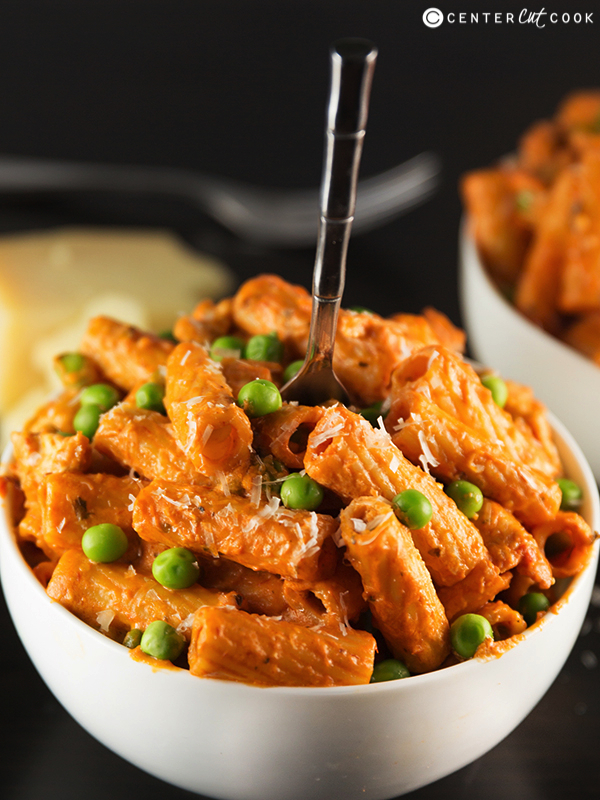 I don’t know about you but this is my kind of show for a cozy Friday night in with a bowl of this Spicy Chicken Rigatoni. Competition on the show is going to be stiff, no doubt! Oh, and did I mention Chef Emeril Lagasse and Ty Pennington (he’s the host!) are coming together for this show? It’s an unlikely combo, but I think it’ll work! It’s going to be fun to watch the winner’s recipe go from just an idea, to an actual offering on the menu. 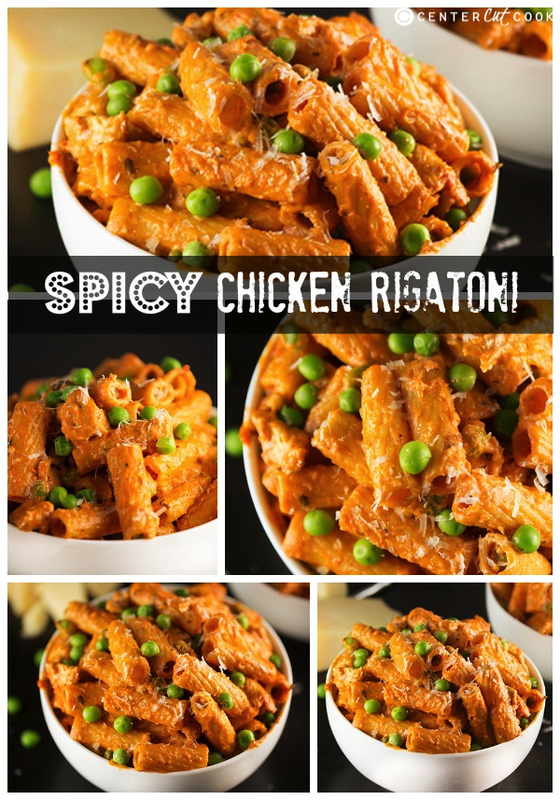 To make this Spicy Chicken Rigatoni, I started by making homemade alfredo sauce that took about 5 minutes from start to finish (seriously easy and will definitely be used in the future for other pasta dishes). I set that aside, then sliced up two chicken breasts into super thin strips and sautéed them in a pan with tons of garlic (a full tablespoon! ), black pepper, and spicy crushed red pepper flake. Once the chicken was cooked through, I added in the alfredo sauce and two cups of marinara and let it simmer for a bit so that all of the flavors could incorporate. 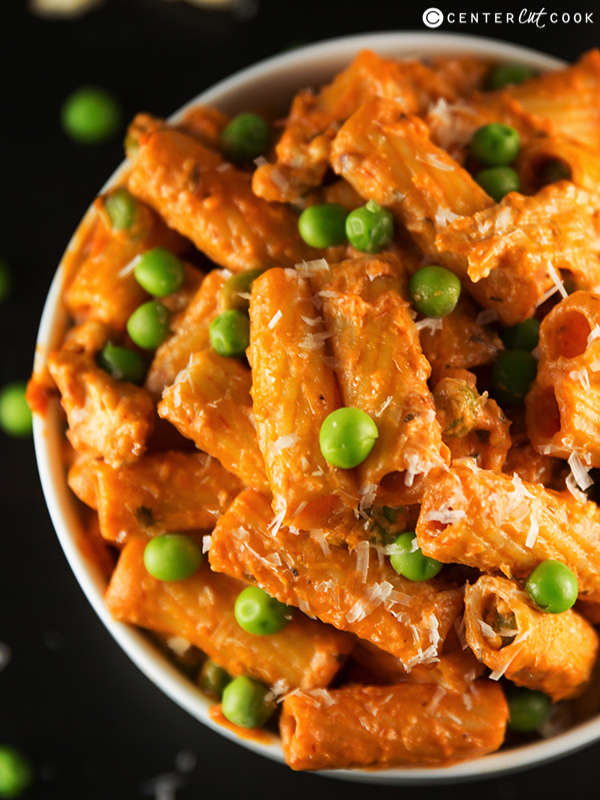 While the sauce was coming together, I boiled a pound of rigatoni noodles, threw in some peas and within 30 minutes, my version of Buca Di Beppo’s Spicy Chicken Rigatoni was ready, and oh, was it good! This dish is pretty spicy which is EXACTLY the way I like it. If you’re not too keen on spice, feel free to cut back on the amount of red pepper flake you add. You could omit it altogether if you want no spice. I served this with our favorite Perfect Cheesy Garlic Bread. I know what I’ll be watching tonight! 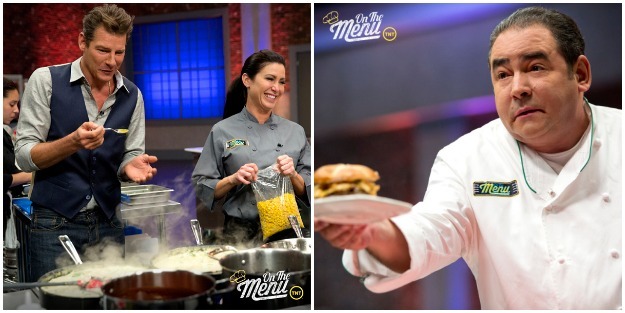 Don’t forget to tune-in to TNT tonight at 8/7c to catch the premier of On the Menu. We can watch it together. :) Check out more details about the show here, and if you want to follow along on social media as you watch, use the hashtag #OnTheMenu. In a large skillet on medium-high heat, heat two tablespoons olive oil. Sauté garlic, red pepper flake, and coarse black pepper for 2-3 minutes. Add in thin strips of chicken breast, 1/4 teaspoon salt, and cook until chicken is done at a temperature of 160 degrees. This should only take a few minutes because the chicken is cut thin. Add in marinara sauce and stir. Then add in alfredo sauce. Let the sauces simmer for about 10 minutes. To the sauce/chicken, add two tablespoons butter and 1/2 cup peas. Stir until the butter melts. Combine chicken/sauce mixture with cooked pasta. Garnish with fresh parmesan cheese, and a pinch or two of red pepper flake.